What Would be the Danger? John looked under the bench and found a piece of wood which he thought would do for a wedge, only the end wanted sharpening. “Shall I take your broad chisel and sharpen it?” said he. “Have I sawed it pretty straight?” John asked. This entry was posted in Historical Images, Uncategorized. Bookmark the permalink. 18 Responses to What Would be the Danger? Ever been on a woodworking forum? I’ll leave it there. That picture is terrifying. Especially the kid on the left of the grinder. Looks like it’s from a residential school, so also likely terrifying in other aspects as well. It looks like a posed photo. The kids look static; no action. The two boys on the right working on the same board! Of course it’s a staged photo! Almost all these school/factory/workshop photos are. Also, some of the paintings are posed, too. Just FYI. Photos, paintings, staged? Next you are going to tell me that WWE is stages too. hmmm, this could help explain my personal vanity. Them boys is wearing mukluks! That was the first thing I noticed! Could be a boarding school, or perhaps a Govt school shop in a rural hub community. The boys appear to have different style muklucks, suggesting that they are from different villages. The boy with the saw has reindeer and the two on the grinder look to be made of seal skin. Some of the other photos in the collection are from the Bering Strait area, perhaps this photo is from Nome. Yes, that’s why am guessing White Mountain Industrial School. I’m not from the bush – I was born in Fairbanks – but both of my parents taught, and my Mom taught in one of the native boarding schools in the late 1950’s/ early 1960’s IIRC. I can check with my mom, but that picture could be at White Mountain Industrial School. The reality was that White Mountain and a few others schools have a difficult history. 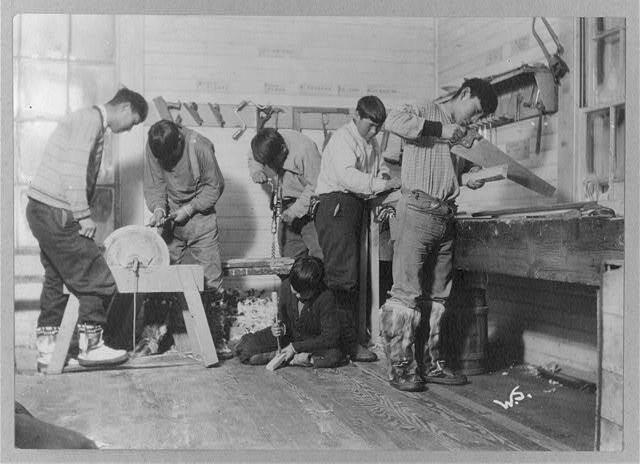 During the first part of the 1900’s children from Alaska’s bush were forcibly removed from their village and sent to boarding schools. In some cases, where their family lacked money (in some cases literally lacked any form of negotiable currency) they would be stuck at the school for years. There’s actually a name for this, it’s called the Dunning-Kruger effect. Pretty interesting. I just finished reading this book and have been trying to decide how to incorporate it into a secondary school curriculum. We need more Ebenezers to prevent there from being more Bill Boobys.